First make the stock if you’re using dried broth cubes. If you’re going to use store-bought stock, heat it up. Put the stock in a medium-sized pan to a boil, then reduce the heat and let it simmer. Finely cut the onion and garlic clove. Grate the pecorino cheese and set aside. Put 2 tablespoons of olive oil in a large pot over medium heat. Then add the finely chopped onions, sauté until golden-brown. This process can take up to 5 to 6 minutes. Add the chopped garlic, give it a good stir and cook for about a minute. Add in the risotto rice, cook for about a minute while stirring frequently. Add 1.5 cups dry white wine and stir until most of the wine has been absorbed by the rice. Add a ladle full of hot broth to the risotto and stir well. Continue adding the broth 1 ladle at a time when most of the moisture has been absorbed by the risotto rice. This usually takes up between 1 to 2 minutes between adding more broth each time. The risotto rice has been properly cooked when the rice is soft, but not at all mushy. Kind of like how al dente pasta is. When the risotto has been cooked, turn off the heat and add the grated pecorino cheese. Stir the cheese trough the risotto rice. Season with (sea) salt and pepper. Grab the rimmed baking sheet and pour the risotto rice onto it. Spread it out to let the rice cool off quickly. Let sit for a while to cool. When the risotto rice has been cooled off completely you can determine how large you want the risotto balls to be. We’ve chosen to make them as large as my (Marco’s) hand, which is quite large. 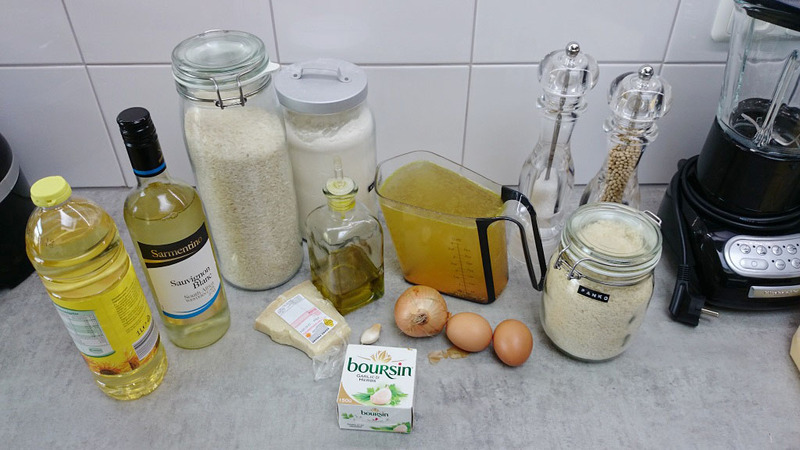 Put some risotto rice into your hand, press a small piece of Boursin cheese into the middle. Grab some more risotto, place it over the other half in your hand and make a ball. Do this until all or most of the risotto has been used up. Rinse hands and set-up 3 medium-sized bowls or deep plates. Fill one with flour, another with eggs (whisk the eggs) and the last one with panko or breadcrumbs. Add salt and pepper to the bowl or plate with flour and mix together. Meanwhile heat up your fryer or pan and add in vegetable oil. You can check if the oil has reached the preferred temperature by adding an oil thermometer to the side. When the temperature has reached 190 degrees celsius ( about 375 degrees fahrenheit ) it’s ready. 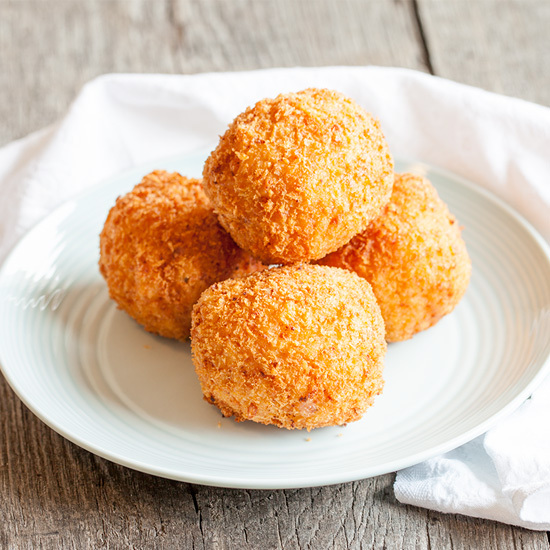 Dip each risotto ball into the flour, then through the whisked eggs and finally the panko or regular breadcrumbs. 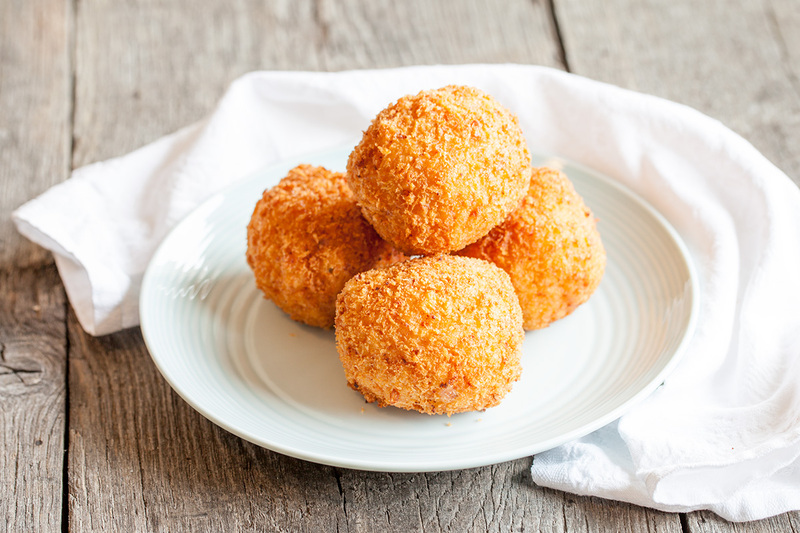 Make up to 3 or 4 risotto arancini balls at the same time, then drop them into the heated oil to fry. Fry until golden-brown, remove from fryer or pan and place onto a plate or cooling rack. 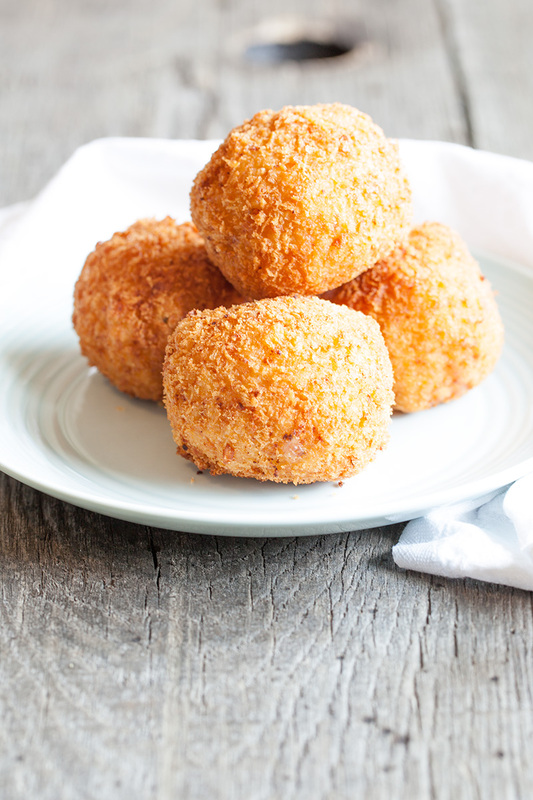 Repeat until all of the risotto arancini balls have been cooked. i could seriously eat a bunch of these! Thank you for your kind words! They were delicious, have you ever tried making them yourself?